It's time for the New Product Launch! All the stamps, Die-namics, and stencils can be found HERE. Please remember to visit each of the MFT Designers' July New Product Launch posts lined on the MFT Blog and leave a comment by the end of the day on Thursday, July 10 for your chance to WIN one of two, $100 Gift Vouchers. The winners will be chosen at random and the prizes will be sent out on July 11. Ready? Set. Comment! I have four fun filled birthday cards to share with you today. The first one features the new Birthday Chalkboard Greetings stamp set and the Blueprints 17 Die-namics. 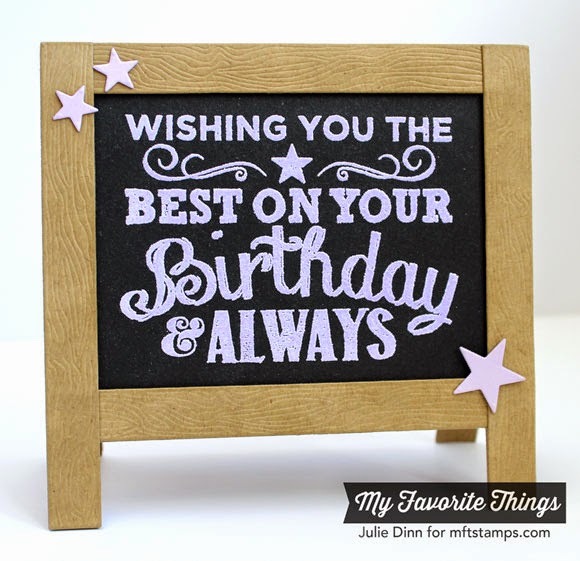 Using Versamark Ink, I stamped the sentiments from the Birthday Chalkboard Greetings and a few swirls from the Chalkboard Greetings Too stamp set on a piece of Black Licorice card stock. I embossed the sentiments with some bright Zing embossing powder. I created a shadow effect on the letters with a white Prismacolor pencil. 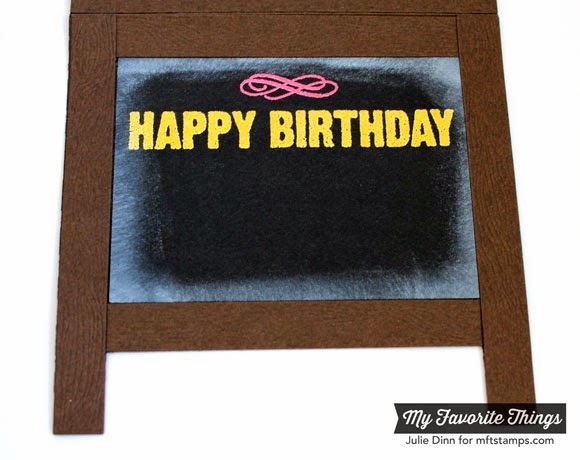 To finish off the chalkboard look, I added some Sweet Tooth Pigment Ink to the edges of the card stock. The chalkboard was die-cut with the Blueprints 17 Die-namics. I used Chocolate Brown card stock and I added a little Chocolate Brown Hybrid Ink to bring out the wood grain. I used the same Birthday Chalkboard Greetings stamp set and Blueprints 17 Die-namics on this card, as I did on the first, but the here look is quite different. This card has a cleaner chalkboard than the first card as I didn't add the extra shading or any extra ink. I used the much lighter Kraft card stock for this card which also changes the overall look. For my next card, I stamped the sentiment from the Birthday Chalkboard Greetings stamp set in Lemon Drop Hybrid Ink. I die-cut the balloons in Lemon Drop and Razzle Berry card stock. 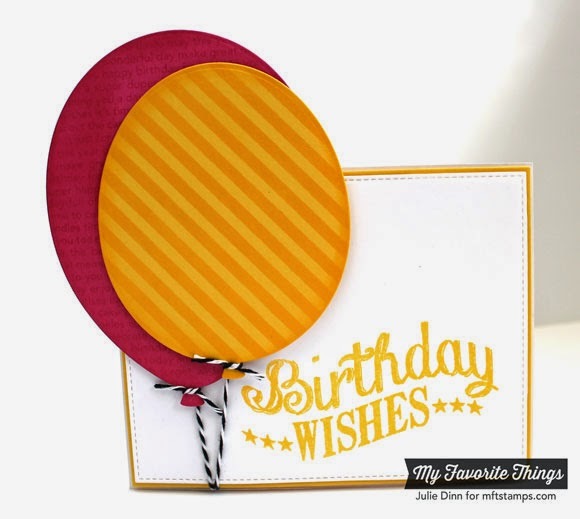 The Razzle Berry balloon was stamped with the Happy Birthday Background stamp. 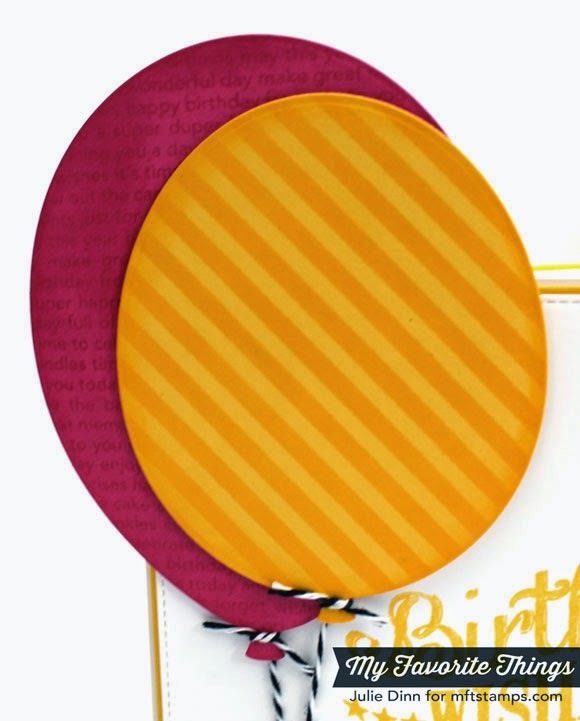 For the Lemon Drop balloon I used the Diagonal Stripes Stencil and Lemon Drop Hybrid Ink. On the inside of the card, I added another sentiment from the Birthday Chalkboard Greetings stamp set. My final card tonight is a sweet one. 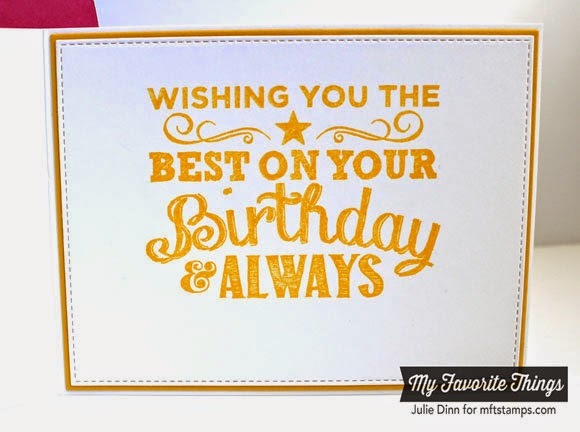 It features the new Sweet Birthday Wishes stamp set, the Birthday Greetings Background, the Pinking Circle STAX Die-namics, and the Diagonal Stripes Stencil. I stamped the cupcakes on a piece of X-Press It card stock and I coloured them with Copics. I added a touch of Sheer Sparkle Glitter Glaze to the top of each cupcake for that extra bit of shimmer. 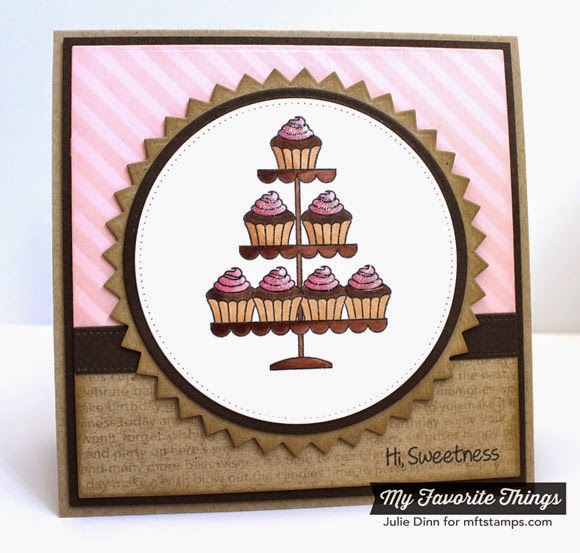 The background was created with the Birthday Background stamp and Diagonal Stripes Stencil. Thank you again for joining me this week. Your sweet comments always brighten my day! Don't forget to check out the MFT Blog to see all the fabulous creations the design team has to share with you. 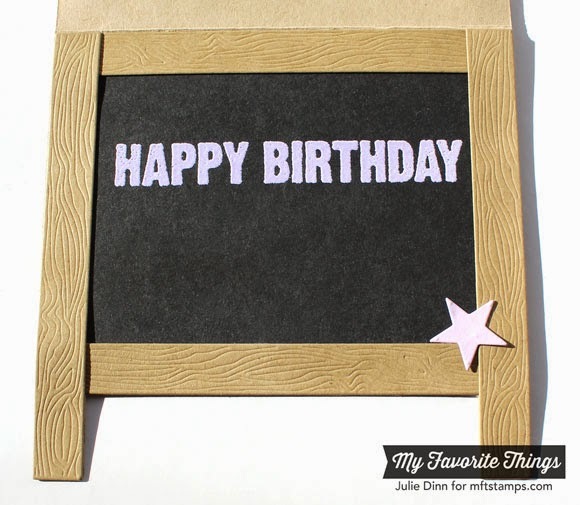 Love the chalkboard sentiments, your cards using them are all so pretty!! Love the colors used in chalk board! Gorgeous cards, Julie! Love the chalkboard! Lovely, really like the cupcake stand, it's so pretty! Such beautiful cards!! The chalkboard cards are by far my fav!!! Super amazing! I love that cupcake card SOOOOO much. ooooo, LOVE your chalkboard cards with the Blueprints dies! And the cupcake tier with the pinking edged circle is amazing! LOVE your WONDERFUL cards. Thanks for sharing. Love your card ideas. I really like the charkboard stamps & dies. Great cards. The Chalkboard Greetings are wonderful and I'm especially loving the balloons. Fantastic cards. Boy I love that blueprints 17 and the Balloon stax. Beautiful cards! Love them all! Thanks for great release! Thanks for week of inspiration; I enjoy visiting with you. I really like the bright colors in your first chalkboard. 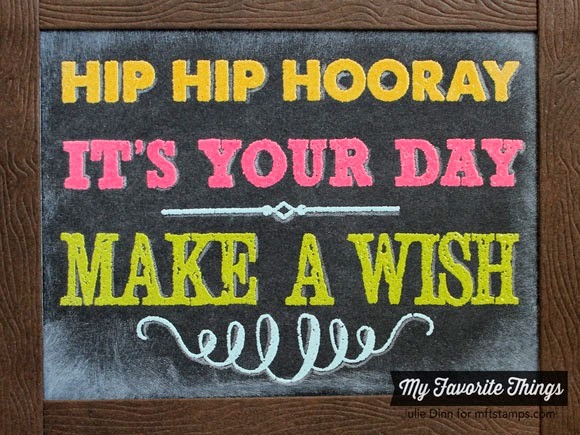 I love your chalkboard cards! So much fun and the sweet birthday set is my #1 must have!!! Great BD cards. It is always nice to have some extras on hand. Fabulous cards! I really like the bright embossing on the chalkboard! Such fun cards especially the chalkboard easel card. 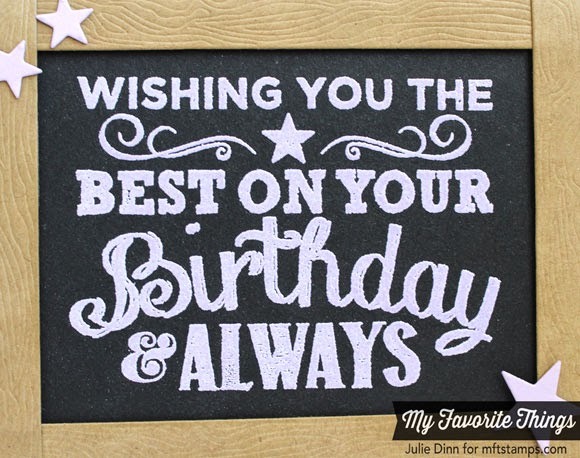 Great variety of birthday cards--love the chalkboard. Beautiful cards and beautiful colors. Thanks for the inspiration. Love all your cards bur the chalkboards are my favorite! Love these super SWEET cards! Those big ol' balloons are SO cool! so pretty - i especially love the one with the yellow chalkboard inside! Wonderful cards! I love the chalkboard look! love seeing all the chalkboard creations! fabulous job! Fun cards! I love the glittery cupcakes. Your chalkboard cards are sweet, and the balloons with the text and the stripes, wonderful. Thanks for sharing your ideas with us. Wow! Nice!! Chalkboards are great!!! Terrific cards and love how you showed off the latest blueprints and those cute balloons and beautiful coloring of the cupcakes! These cards are great!! Love the colored and white chalk on the chalkboard cards!!! Totally digging and loving all your work here - you did a fantastic job!! IT must be so fun to play with such great products!!! I really like the detail in your designs--like the trouble you went to in using different colors on the chalkboard and how you made it look so realistic. Very nicely done. I love that chalkboard die. going to have to purchase it. Worked out great for your sentiments. Love the sparkle on the cupcake icing. Adorable cards! I'm in love with the chalkboard! Such fun cards. Love the colored embossing on the first one. Thanks so much. I love the chalkboard cards! The first one is really fun and festive! Love them all but those cupcakes. My oh my. the chalkboard is so darn cute....it is coming to my house. Can't wait to give it a try. I like the "chalky" look of your first card. Love the bright colors on the chalkboard!!! The chalkboard is just adorable. Love this die! All wonderful cards! I adore your balloon card...somehow I missed that one of the balloons was ginormous LOL! I can't wait to use them! Hhhmmmm...I need to get me some Glitter Glaze!!! So fun!! This chaldkboard card die is really just adorable! And I LOVE that last card; so "sweet" (pun intended). Loving that easel and great chalkboard technique, especially love the 'colored chalk'. my goodness so many new wonderful products - I want them all!!!! 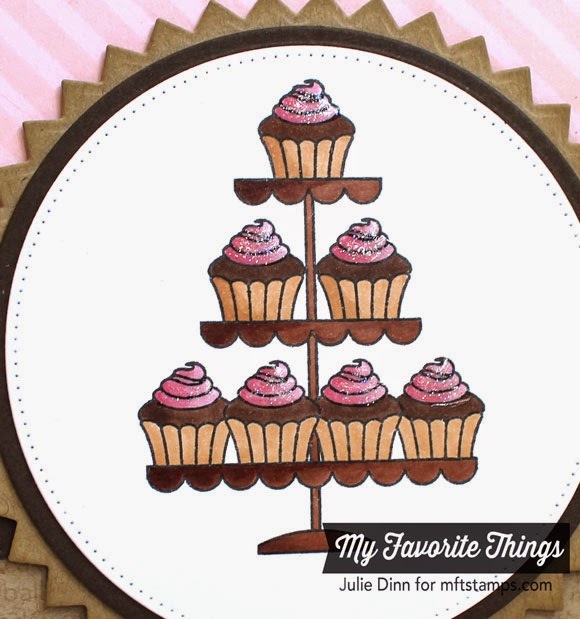 I particularly love your cupcake card and the touch of glitter & colors! Such cuteness!! I love this signboard die and set. So sweet! The chalkboards are too cute! Very sweet cards! One of these days I'll give the chalkboard technique a try. Love all the chalkboard techniques!! 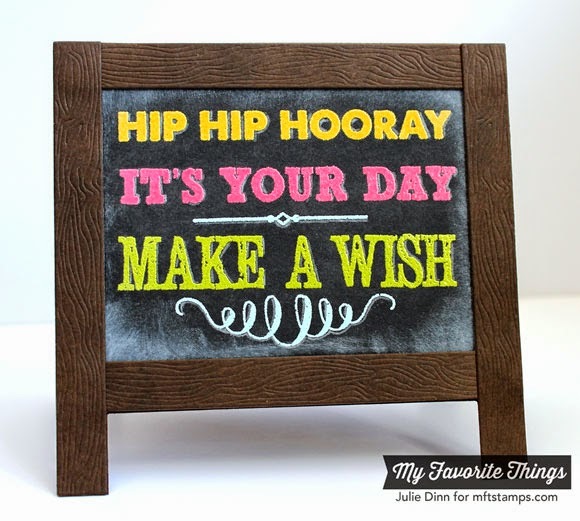 Love your chalkboard designs they are amazing! All of your cards are great, but I love the "chalkiness" on the first one and those cupcakes in the last one made me hungry! Julie, these are all wonderful! I love the multicolored first one. Looks just like they have at restaurants with the colored chalk. Fabulous designs! Your first listed card.....looks like a real chalkboard. Amazing. Your cards are great. I can't remember an MFT release that had so many items in it that I want like this one does. I really like your first card with the bright embossing on the black background. It's amazing how just the addition of the white pencil makes such a difference too! Your cards are amazing! I love that diagonal stripes stencil. I haven't used a stencil yet but you're making me think I want to give it a try!